If you need to hide All Site Content links for unprivileged users, follow the steps shown below. Your application’s master page is to be modified. If you use a built-in master page (for example, v4.master for 2010 or default.master for 2007), I recommend to create a full copy of the built-in one and deploy it. 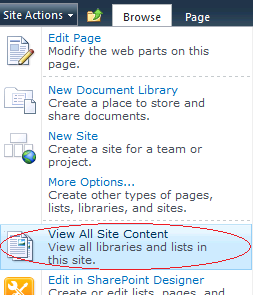 These steps are described in the article SharePoint: How to create a custom master page. In the master page, locate all places where _layouts/viewlsts.aspx is pointed out. You’ll likely find several controls (for example, a MenuItemTemplate, a SPLinkButton and so on), which render All Site Content links one way or another. These controls can be divided into three groups described below. The control represents an item in the drop-down Site Actions menu. The control represents a link in the Quick Launch Bar. So, change the PermissionsString property of the above controls to ManageWeb. 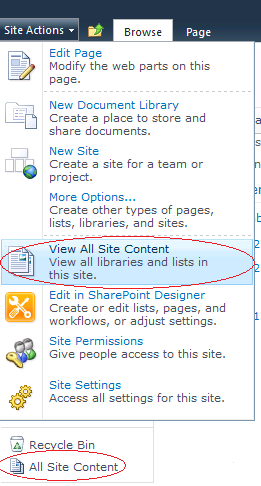 Here the SPLinkButton represents the All Site Content link in the Quick Launch Bar as well, but it’s displayed for applications migrated from SharePoint 2007 with the previous version of UI. So, set the PermissionsString of the surrounding SPSecurityTrimmedControl to ManageWeb. Let’s sum up. If you see a control exposing PermissionsString, set the property to ManageWeb. If a control is within a SPSecurityTrimmedControl, set the PermissionsString of the last one to ManageWeb as well. And finally, if it’s just a control, add a new SPSecurityTrimmedControl, place the first one in it and set the ManageWeb permission.